Facebook has rolled out a new feature in their Messenger app for iOS and Android that allows you to chat with your friends and family via video. The feature is completely free to use, works over Wi-Fi or LTE, and is a great competitor to products like Skype, Google Hangouts and FaceTime. Video calling within Messenger is very straightforward. To start a video call, all you have to do is press the video camera button from within the chat window. When the call has connected, you can switch between the front and rear cameras, and even turn off the camera entirely. The feature is designed to work on low-bandwidth cellular networks, so even if you have a spotty LTE connection, your call should still be of reasonable quality. You should probably keep an eye on your data usage while video calling over mobile networks though, as it could end up chewing through a lot of your data cap. Currently video calling through Messenger is only available for those in the following countries: UK, US, Belgium, Canada, Croatia, Denmark, France, Greece, Ireland, Laos, Lithuania, Mexico, Nigeria, Norway, Oman, Poland, Portugal and Uruguay. Facebook will be expanding the service to other regions in the coming months. The addition of video calling to Messenger continues Facebook's expansion of the platform over recent years. The company already provides peer-to-peer mobile payments and standard voice calls through their Android and iOS apps, and there's also a standalone Messenger website for desktop users that launched less than a month ago. 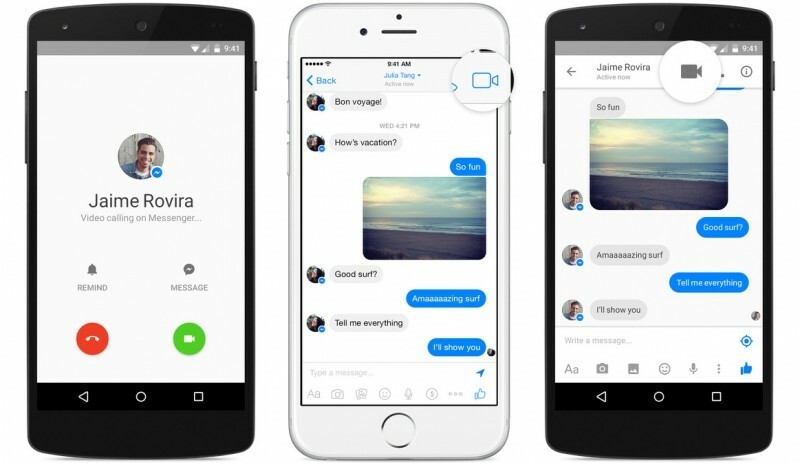 You can download Facebook Messenger here.